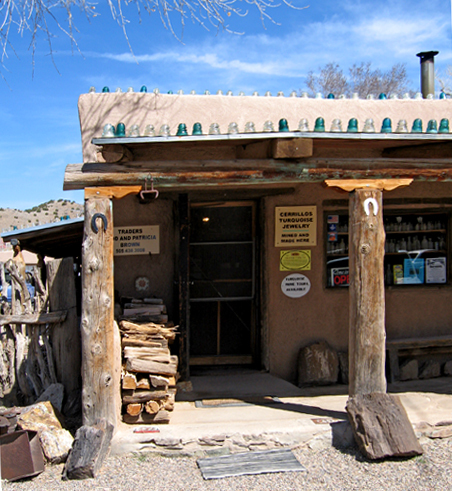 Los Cerrillos has always seemed to me to be the perfect example of a New Mexico boom town. Once the unofficial capitial of the state, it’s now a modern day ghost town on South 14, a few miles north of Madrid. After the arrival of the Santa Fe Railroad in 1880, shipping the gold, silver, lead, zinc and turquoise from the 3,000 miners in the area no longer had to be shipped by wagon. Los Cerrillos grew to feature 21 saloons, 5 brothels, 4 hotels, several dance halls and a real honest-to-goodness Opera House. The construction of Saint Joseph’s Church on Main Street confirmed that civilization had truly arrived. Today, the washboard streets and dusty storefronts are a mostly undisturbed reminder of Old West meets celluloid. 13 films have been shot in and around Los Cerrillos, including the 1972 John Wayne movie The Cowboys shot just outside of town. A remnant of the production of Young Guns lingers on a two-story stucco wall. The real Wortley Hotel (Motto: No Guest Gunned Down in Over a 100 Years) is in Lincoln, not Los Cerrillos. On weekends, Mary’s Saloon and the Casa Grande Trading Post, Cerrillos Turqoise Mining Museum, & Petting Zoo swarm with tourists from the City Different stopping off on the Turquoise Trail. Several seasonal businesses open up with the return of the tourists, adding whimsical touches. 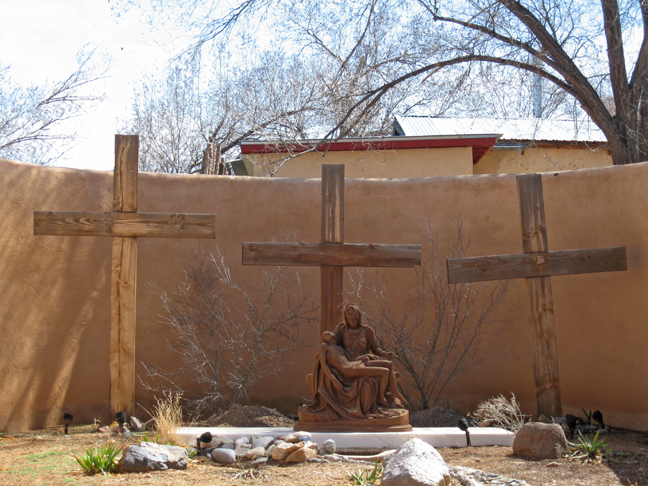 Several artists call Los Cerrillos home. Metal sculptures and eclectic murals are scattered though the tiny town. 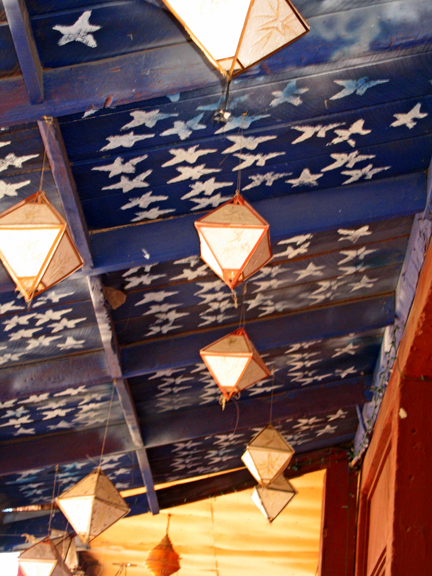 A few of the gritty, sandblasted storefronts now make it possible to walk under the stars as you stay out of the sun. My connection with Los Cerrillos was very short-lived. My job working weekends at the Tiffany Saloon and Melodrama ended when, as usual, my confidence in British mechanics was misplaced and my 1961 Morris Mini-Cooper needed a new engine. 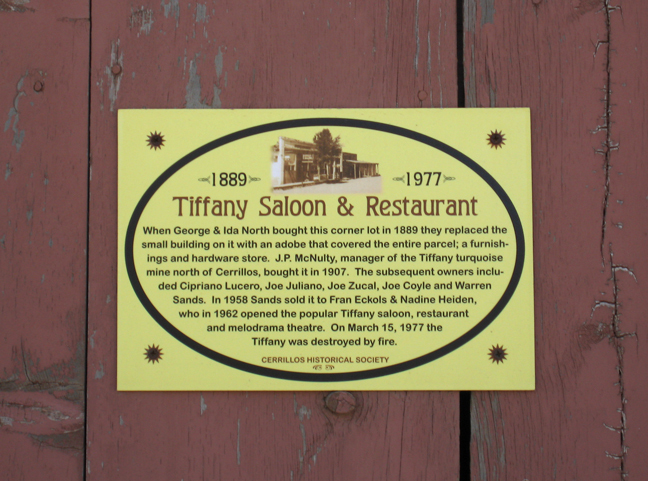 The Tiffany Saloon and Melodrama burned down in 1977 but you can still find traces of it, and other long-lost buildings, by looking for the metal yellow signs all over town.